As a genealogist the card provides no clues about family threads; as a family historian I can find no details that shed light on a family story. 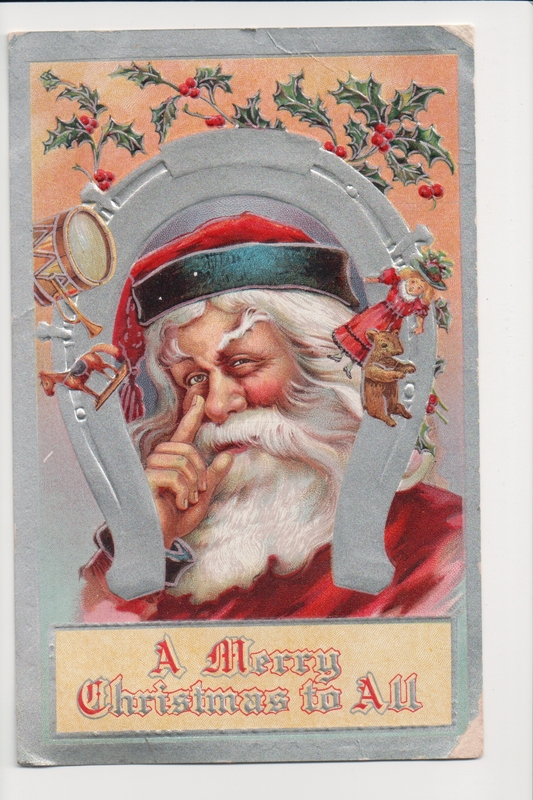 Nor are there clues and details regarding the publisher or printer, other than this Santa message was printed in Germany, as were most cards of the era. 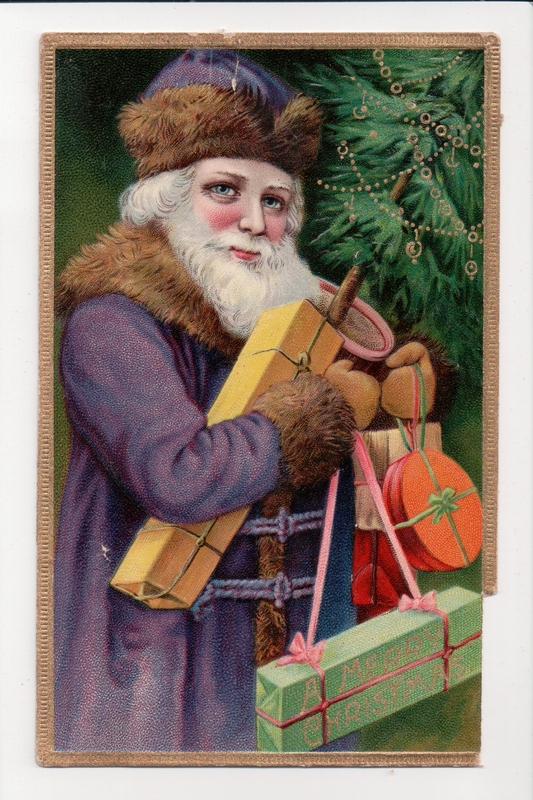 However, the painting is remarkable in a couple of details – Santa is dressed in a purple robe trimmed in brown fur, as opposed to the red suit trimmed in white fur seen in my other cards. 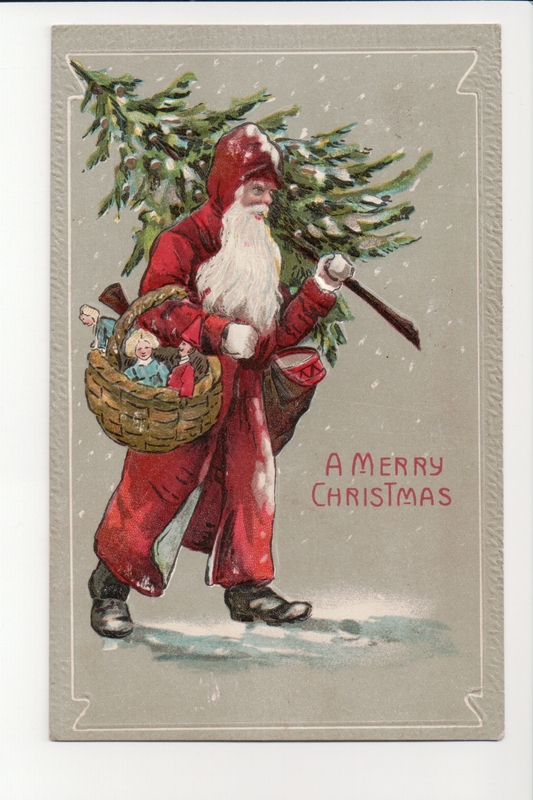 This Santa also bears gifts which are wrapped and carried, not stuffed in a sack, and a decorated, potted tree. 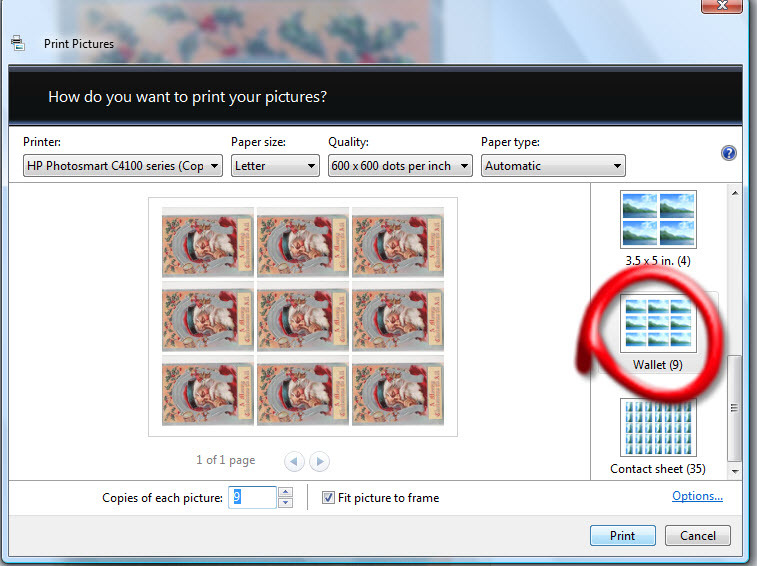 I wonder what traditional tales this Santa is drawn from? If you know, dear Reader, I hope you will leave a comment below! Merry Christmas! If safe-keeping is any indication of what we value, then a Santa gift from 1960 must be one of my most important treasures. Both the doll and the doll bed, complete with original bedclothes sewn by my mother, are stored in my attic, saved for some distant day when a grandchild comes to visit. I turned the doorknob and fell into our foyer as Brad pulled the front door open with a flourish. Just that day there had been a heated discussion at the third grade coat rack about Santa’s capabilities, with some friends even whispering that *he might not even exist*. I greeted my five year old brother’s pronouncement with a little skepticism and a tiny sliver of hope. Just then Richard came in from the bus stop and, upon hearing of the elf, demanded more information–which the preschooler gladly provided. 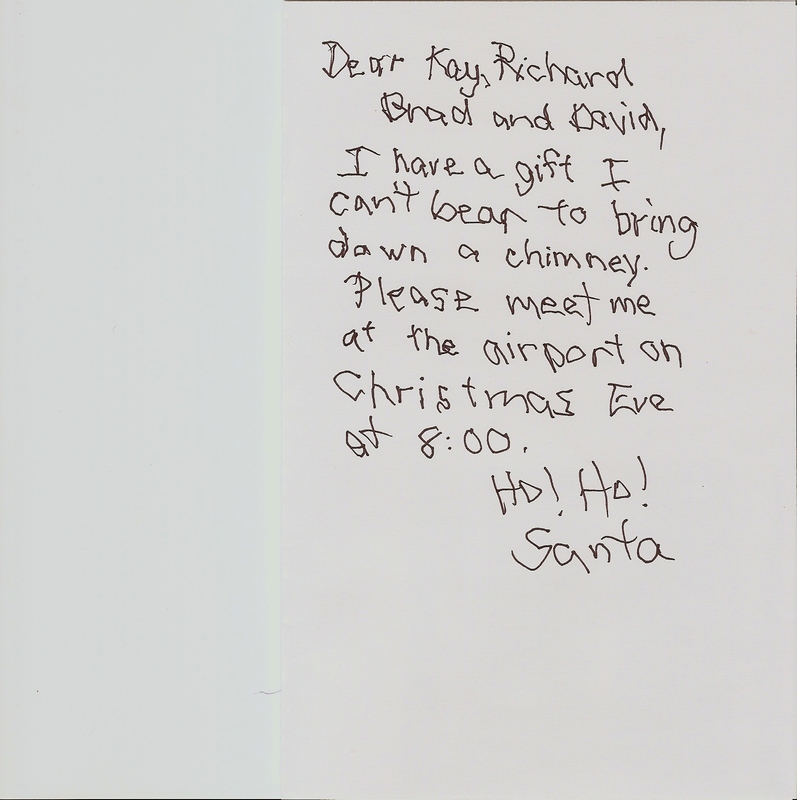 It certainly seemed authentic; the scratchy scrawl was Santa’s writing. Just last year I had criticized his penmanship only to be reprimanded for not understanding just what all those sub-zero sleigh rides could do to a person’s hands. 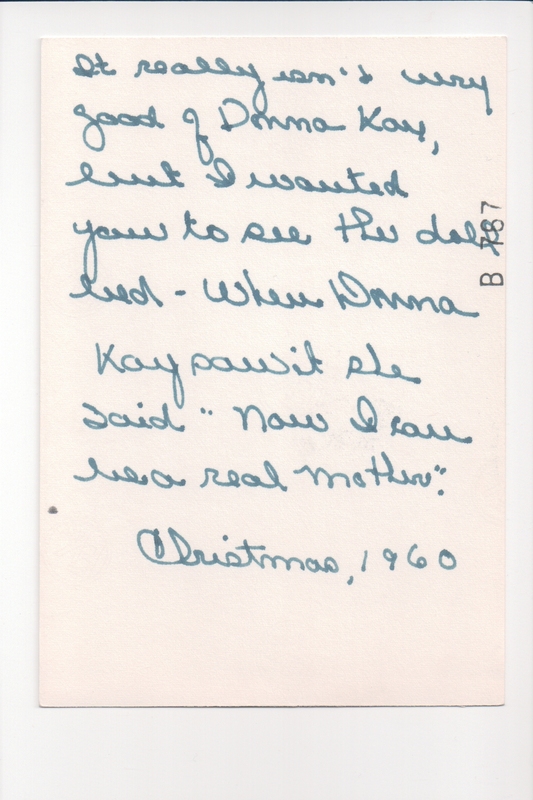 So I felt reasonably certain that this note was actually written by the same arthritic hands that had annually tagged our Christmas gifts all my life. As my mouth stopped reading other mouths started voicing the questions we all shared: Just what gift would be undeliverable by chimney? Was it too big? Was it alive? Was it magical? Must it be kept clean and free of soot? 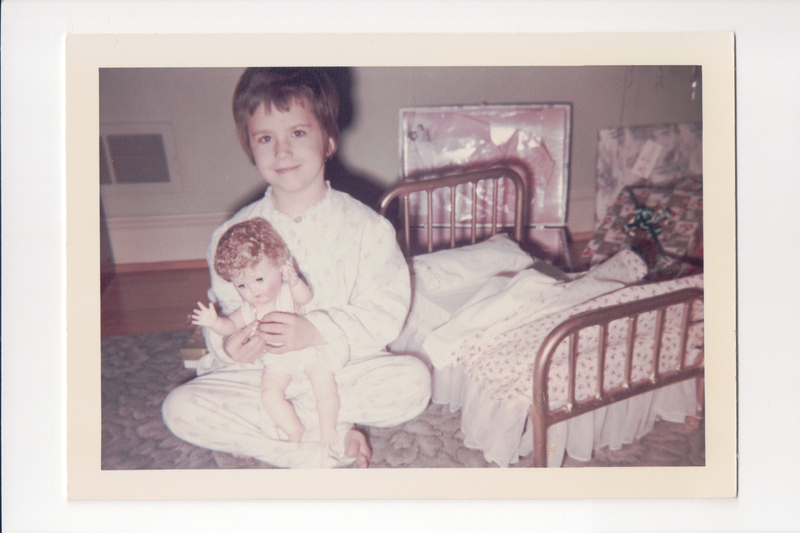 Daily speculations led to a long list of possibilities: a pony, a puppy, a baby sister, a monkey, a Martian, a magic car. No dream was too wild, no hope too irrational to be placed on our list. WHAT WAS SANTA’S SECRET????? By Christmas Eve our yellow green house could barely contain the excitement. 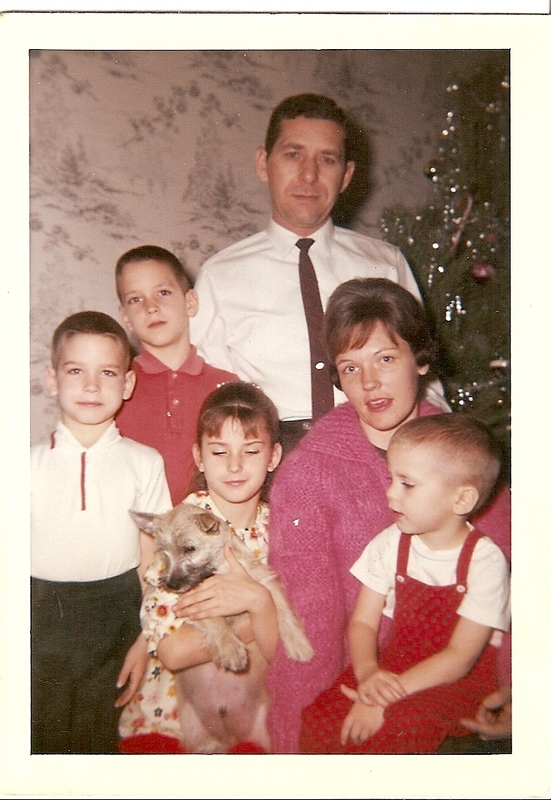 I am certain our parents groaned at the prospect of dealing with our uncontrollable glee all day. After breakfast we set out to play; “OUTSIDE,” said our mother. Our lunchtime requests to get started for the airport were met with the logical reminder that it wasn’t that far away. We would not depart until after dark. And then we bundled up to play outside once more. Four sets of excited hands zipped up car coats and pulled on hats or coat hoods, then out of the house there arose such a clatter! We jostled into our traditional places in the back bench seat of the car–I got the driver’s side window, Richard got the other window, and Brad and David squeezed in between us. No seat belts existed to constrain our joyous wiggles. The windows grew steamy as Daddy inspected the tires’ chains then threw up the garage door. Finally the car was full and the garage was empty! David stood up on the “hump” that housed the Ford’s drive shaft, clutching the front seat with his tiny hands and singing, “Santa, Santa, Santa!” The soft ching ching ching ching of chains on snowy roads accompanied our caroling as our white sleigh took us closer and closer to our appointment. We sang every carol we had ever learned at home or at school or at church. Ching, ching, ching, ching. At last up ahead, little lights could be seen. Not the lights from decorated trees or family-filled homes, THE lights. Airport lights. We all sighed deeply as our father parked the car, and our mother opened the doors to release us. Like a swooping flock of Canada geese the family entered the airport’s single, cavernous room. I felt a twinge of panic. My brothers and I surveyed the room. No Santa inside. We ran to press our noses up against the glass at the far end, and looked out on an unobstructed view of an empty tarmac. No sleigh. No elves. No reindeer. 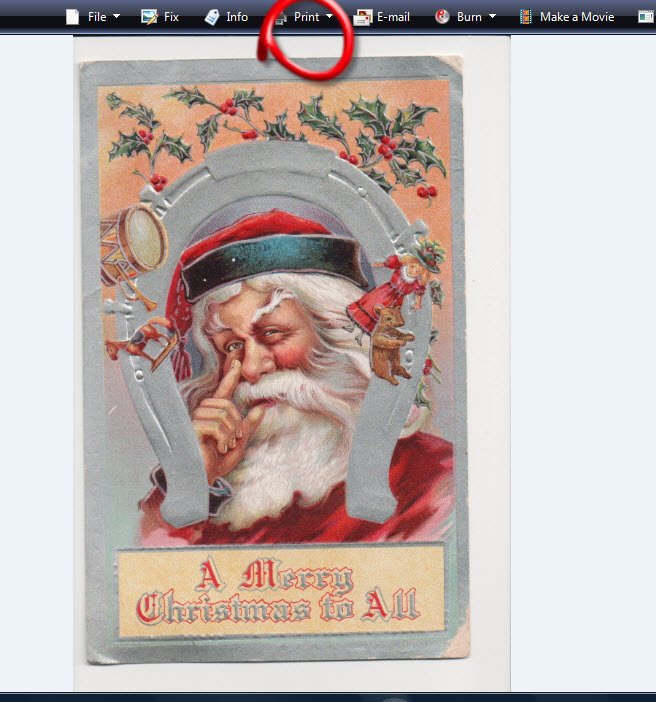 With a twinkly smile the gentleman put his finger to his nose. “Just a moment,” he said before he walked away. We were left to squirm, wiggle, tug on parents’ hands, wonder, moan, and squirm some more. Shortly he returned carrying a box. “A crate of oranges? Santa asked us here to pick up oranges?” I wondered. But as the man approached we all realized that this was no ordinary box. It was closed on all sides, save one, and on that one open side there was a grate. “Santa told me to make sure the Strickland children got this,” and he set the crate at our feet. All at once, very gently and carefully, we knelt down to peer inside. Two chocolaty eyes stared back. A dark, damp, cold bit of nose sniffed our curious faces and then a little pink tongue darted out to wish us a Merry Christmas. Eagerly we welcomed our sandy-colored, Cairn terrier puppy, Sir Nicholas of Nottingham–a wild, irrational dream come true! 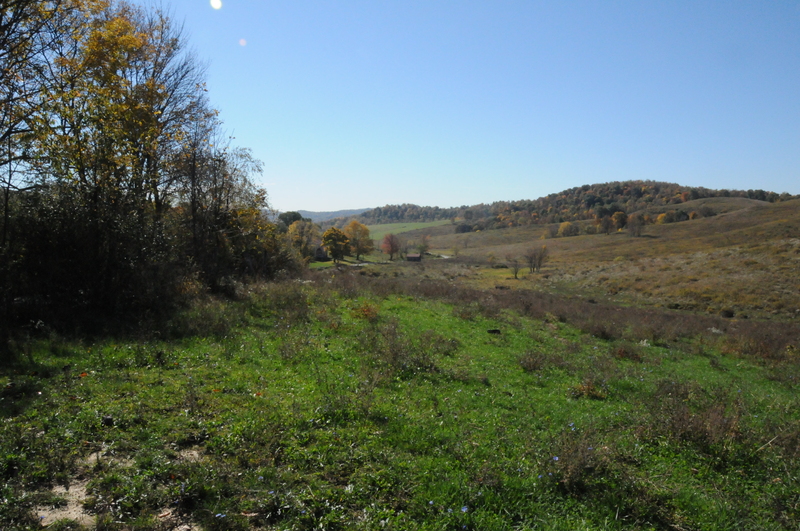 This story was originally published in this blog December 6, 2010.